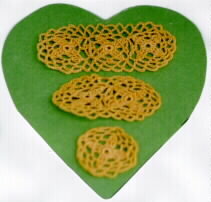 $12.95 - New Crochet in miniature #3 by Ruth Hanke. Ruth has crocheted for more than 52 years and has written this crochet book and patterns for the "real big world". This is the third miniature crochet book designed entirely by Ruth. Color pictures included.